Arunachal Pradesh CM Pema Khandu warns CoSAAP not to go for strike, otherwise govt will take strong action, and imposed PR. Arunachal Pradesh Chief Minister Pema Khandu warns CoSAAP not to go for pen down or toll down strike, otherwise govt will take strong action, and if necessary will imposed President rule in the state. He was speaking in a Official function at Kalaktang. Reiterating his stand on CoSAAP’s agitation, Chief Minister said the state govt will not bow to their blackmailing tactics. He said the state govt is not opposed to their demand and has only stated that their demands cannot be met at one go and will be only implemented phase wise depending on the financial conditions of the state. He also reiterated that state govt will strictly enforce CCS rules applicable on pen down tool down strike leading to ‘dies non’ and even service break. 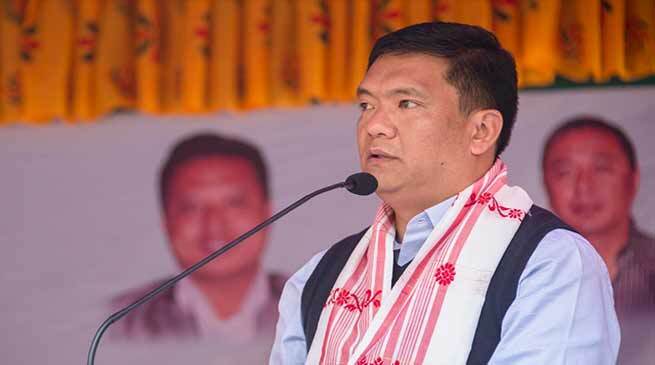 Further Khandu said the state govt will also not hesitate to terminate the agitating employees even if that may extend to thousands. He said the govt is ever ready to recruit fresh unemployed youths to fill up those jobs.